Burgenland is the easternmost state or "Land" of Austria. It was created following the Treaty of Trianon, a peace agreement signed in 1920 between the Allies of World War I and Hungary. This treaty reduced the size of Hungary. Hungary had to let Austria have the former "Deutsch-Westungarn" (German Western Hungary or Burgenland), a Hungarian but German-speaking province. In those days, people remained uncertain about the right name they should give to this newly established state. The name of "Vierburgenland" (Land of Four Castles) was brought up among others. It was derived from the name of the four Hungarian "vármegye" (in German Komitate, "counties") respectively known as Preßburg (Bratislava, Slovakia), Ödenburg (Sopron, Hungary), Eisenburg (Vas, Hungary) and Wieselburg (Moson, Hungary) which had to cede a part of their respective territories to this newly established province. Nevertheless, when all was said and done, as none of the four towns that had given their names to this new state were situated in the region itself, it was decided not to include the number of former counties in the name of the province and it was thus agreed to call it "Burgenland", a name that is still commonly used today. Burgenland borders the Austrian provinces of Lower Austria and Styria to the west, and Hungary to the east. To the north, it shares a border of only a few kilometres with Slovakia, and it shares an even shorter border with Slovenia to the south. This territorial configuration led to the fact that Burgenland is the unique Austrian state that shares a common border with Hungary. The shape of the territory of present-day Burgenland will remind you of that of a sandglass: the state is made up of two territories, Northern and Southern Burgenland which are only connected through a narrow four-kilometer-long panhandle. Northern Burgenland represents the best part of the very picturesque Pannonian plains, this area is particularly noteworthy owing to a plane topography on the one hand and a warm climate with scarce rainfalls on the other hand. In Northern Burgenland, Lake Neusiedl covers 315 km² (120mi²) and is more than 22 miles long for 4 to 9 miles wide. It is the second largest steppe lake in Central Europe and shelters an exceptional fauna and flora. This area offers you numerous possibilities to have a good time. Another asset of this area is its geographical proximity with Vienna that earned this area the nickname of "Sea of the Viennese". The best part of Lake Neusiedl, around 240 km² (92mi²), is located in Austria and the last 80km² (30mi²) are in Hungary. From both sides of the border, immenses nature reserves allow to safeguard the survival of vegetal and animal species. Northern Burgenland is also very popular thanks to its vast network of bicycle paths with very picturesque itineraries and well-adapted paths for children. Unlike Northern Burgenland and its immense Pannonian plains, Southern Burgenland, composed of the following districts: Oberpullendorf, Güssing, Jennersdorf and Oberwart, is to a large extent very hilly. In Burgenland, Írottkő (or Geschriebenstein) is the highest mountain of the Kőszeg Mountain range, it rises to 884 metres (2900 ft) above sea level. Geschriebenstein is the last foothill of the Eastern Alps and it is at the same time the physical representation of the national border between Austria and Hungary. An observation tower built in 1913 stands exactly on the border between Austria and Hungary. The cross-border Írottkő Nature Park extends on both sides of this border. Moreover, Southern Burgenland deserves more the name of "Burgenland", because you can find there some impressive castles, especially "Burg Lockenhaus" (cf. photo), a castle built around 1200 and initially called "Leuca" or Burg Güssing, acquired by the Batthyány family. Nevertheless, Southern Burgenland does not only fulfill cultural demands, but also the demands of the ones who looks for relaxation, they will find it in the very popular health resorts of Lutzmannsburg, Stegersbach or Bad Tatzmannsdorf. Eisenstadt: Ödenburg (Sopron, Hungary) should in fact have become the capital city of Burgenland, but Sopron's status as part of Hungary was decided by a local referendum, Eisenstadt thus became Burgenland's capital city instead of Ödenburg. It really was not a bad choice, because Eisenstadt captivates visitors thanks to its nice small town atmosphere, picturesque urban landscape and numerous well-known sights, especially Haydn's tomb, the Schloß Esterházy (a very famous palace in Eisenstadt) or the Österreichisches Jüdisches Museum ("Austrian Jewish Museum" in English) that is located in the Jewish quarter of Eisenstadt. Lake Neusiedl is the second largest steppe lake in Central Europe. As it has already been mentioned, it straddles the Austrian-Hungarian border. For nature lovers, the lake opens the possibility of discovering exceptional flora and fauna in the National Park Neusiedler See-Seewinkel. If you are fond of water sports, you will have a good run for your money in the numerous open-air pools all around Lake Neusiedl and you will be able to take advantage of the lake with a motor boat, a sailing boat or a pedalo. You will have also the possibility of taking advantage of the nice warm sun by splashing about on the shore. If you are eager to learn, the lake area offers a wide choice of cultural monuments; Rust, for example, that is well-known because of the storks which live there; or the large first century Roman quarry in St Margarethen. For music-lovers, numerous concerts and festivals take place in the area of Lake Neusiedl. Haydn concerts in the Schloß Eszterházy, first class lyric performances in the Roman quarry of St. Margarethen or the Austrian Operetta Festival, on the biggest floating stage in the world in Mörbisch are always very popular in the Austrian and international public opinion. Moreover, Lake Neusiedl is well-adapted for children. A special offer is particularly meant for them: only 100 metres from Lake Neusiedl, next to St. Margarethen, you can find the "Familypark Neusiedler See" amusement park, that is the biggest amusement park in Austria dedicated to fun, games and relaxation for tens of thousands of young visitors and hundreds of families from the whole of Austria, Hungary or Slovakia who are attracted to this park every day. 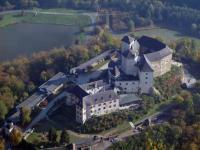 The Forchtenstein Castle is situated south of Mattersburg above the Wulka valley. The first part of the castle with its 50 meter high keep was built at the beginning of the 15th century. At the beginning of the 17th century, the Esterházy family received the castle from Emperor Ferdinand II and started to fortify the crumbling castle and refurbish it. The castle became a fortress and was used by the princely family as a treasure vault for weapons, archives, chronometers, machines, exotic animal preparations and other "marvels". Hidden corners of the treasure vault remained undiscovered and intact throughout World War II and during the Occupation. The original glass-paned cabinets containing the collection are works of art in themselves and the collection can still be admired in Forchtenstein Castle. Burg Lockenhaus is situated in the Kőszeg Mountains (Günser Gebirge in German), a mountain range in the Alpokalja area, the easternmost region of the Alps. Burg Lockenhaus rises on a rock above the town of Lockenhaus. The castle was built around 1200. This building may be related to the presence of the Knights Templar in Austria. The Esterházy family owned the castle from 1676 to 1968. Before that, the owners of Burg Lockenhaus changed on many occasions in the course of history. In 1968, it was sold to the writer Paul Anton Keller and was entirely refurbished thanks to a considerable financial investment. This castle is today a very attractive destination thanks to guided tours, medieval games or other	exciting leisure activities. Burg Güssing, that was built and mentioned for the first time in 1157, towers on a steep porphyric rock above the town of Güssing. It is the oldest castle in Burgenland and a regional landmark for Southern Burgenland. The noble Héder family from Güssing led an aggressive policy of expansion until 1327, when the family was definitely subdued by Charles I of Hungary. Burg Güssing was regarded as being impregnable until 1490 when it was besieged and conquered by Maximilian I of Habsburg, Holy Roman Emperor. Since the mid-16th century, Burg Güssing has belonged to the Batthyány family and since the eighties it has sheltered a foundation that had been created by the same family with the contribution of the state of Burgenland. Thanks to large-scale restoration works, this castle got back its former impressiveness and is today a very worthwhile destination for the young and not so young alike. How to rent a bus for excursions in Burgenland? It is with great pleasure that the Burgenland Bus team offers you to rent a coach, a bus or a minibus with a driver for your sightseeing tours in Burgenland. For any further question about the bus rental with Burgenland Bus, you will find more information here: How to book a bus excursion?. 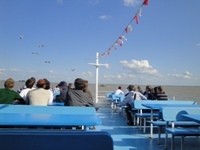 We will be also delighted to take you anywhere you want to in Burgenland. In this regard, you will find more information here: How to book a bus for a tranfer?. It is with great pleasure that we will answer your questions and advise you !